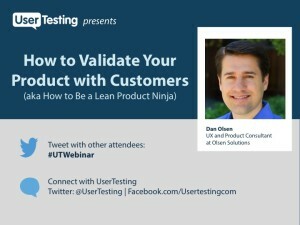 Here are the slides from my UserTesting.com Webinar on “How to Validate Your Product with Customers” on July 30, 2014. If you’re in the San Francisco Bay Area, I encourage you to check out the Lean Product & Lean UX Silicon Valley Meetup I host at Medallia in Palo Alto. This entry was posted in Uncategorized on July 30, 2014 by dano.